The mixing and matching of different fabric structures in one look not only adds dimension to your look, but can also give casual styles a more dressy appeal and the other way around. Combine chunky with refined textures, shiny with matt fabrics and detailed prints with minimalist basic qualities – today we’ll give you the know-how you need about the latest fabric trends! The appearance of a fabrics is determined by the way yarns are spun and in what kind of weave or knit structure they are processed. That’s why the same raw material – like cotton, silk or wool – can have a totally different look in every canvas. This season is all about chunky knits, varied structures and the use of different yarns in one design. We’ve chosen for a combination of a chunky knit – with different knitting stitches and yarns – and an extra-fine silk quality in a shiny satin weave. Corduroy, velvet, jacquard, brocade, plisse and ausbrenner – this season we opt for statement prints, distinctive textures and a lot of details. And preferably combined with each other! The spotlights are on retro-inspired fabrics. From corduroy to embroidered floral designs and sharp pleated structures – dare to experiment with fabrics! 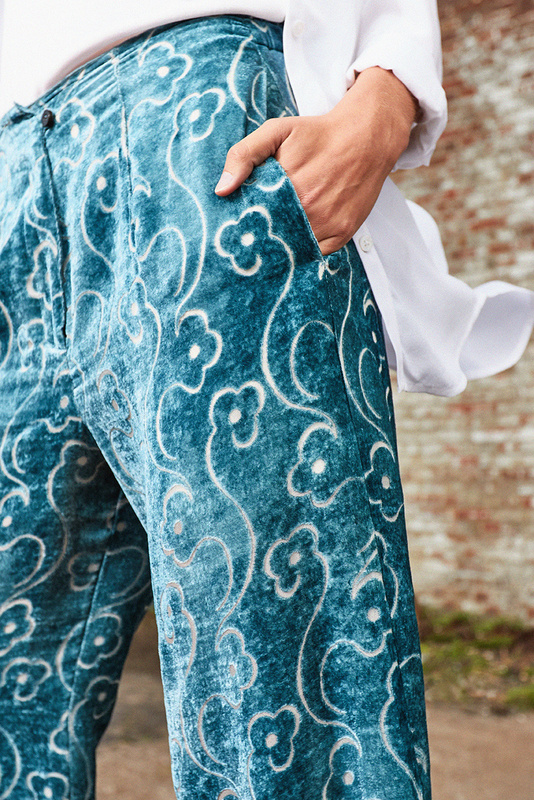 We’ve chosen for wide-legged pants cut from a velvet quality that features an ausbrenner pattern*. When combined with a minimalist matt silk blouse, a powerful interplay of different qualities arises. And exactly that contrast ensures that the unique properties of each fabric are emphasized. * An ausbrenner fabric always consists of at least two materials, one of which is dissolved by means of a laser or chemical paste. This creates a transparent pattern. When you’ve decided which statement item to go for, combine it with a fabric that has the absolute opposite properties for an interesting balance. The result? A dimensional look that never bores! Opt for refined weave and knit structures that offer a supple drape. Think of silk, jersey, satin and crepe weaves. Curious about the unique properties of different materials and how to care for them? Read all about it in our style guide material overview!